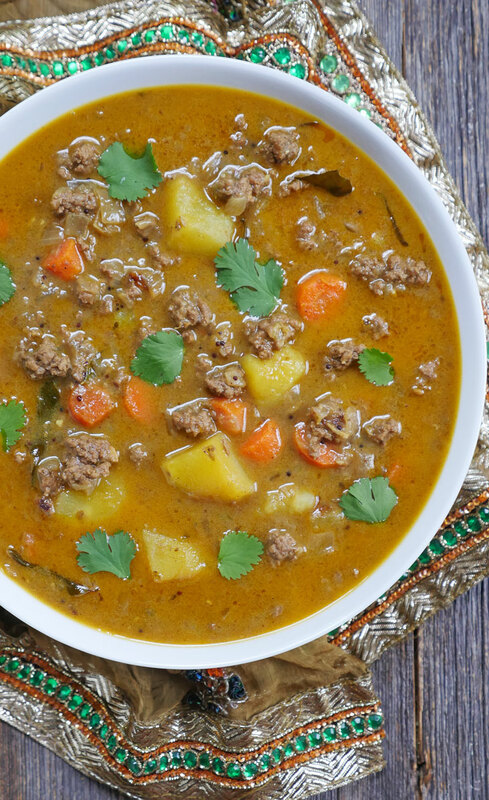 This delicious, comforting and aromatic Kerala ground beef stew is made by cooking ground meat, potatoes and carrots in spiced coconut milk. 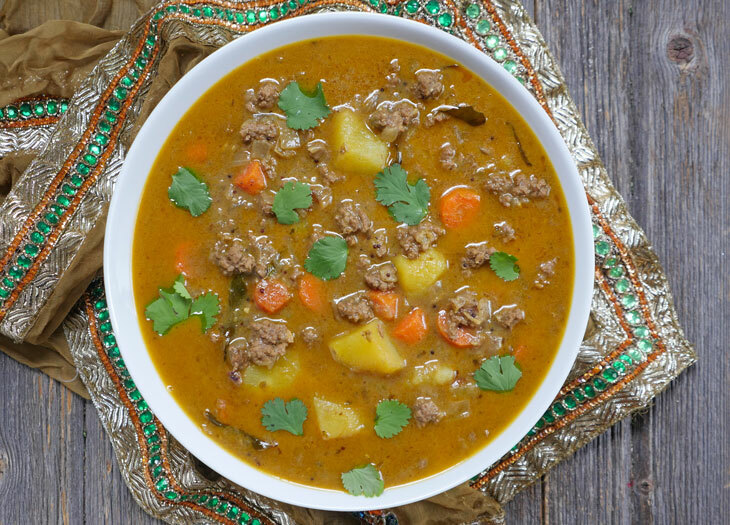 By using an instant pot, you can have this stew ready to eat in no time! This ground beef coconut milk stew is my simpler take on the popular Keralite “ishtu” (stew). Rather than use stew meat, I use ground meat because it’s a protein I almost always have on hand and it cooks very quickly – making this an easy dish to throw together at the last minute. The coconut milk helps to mellow out the stew, making this a mildly spiced curry. This is typically served as a special weekend breakfast or brunch dish but thanks to the instant pot, it’s so easy to make that I often whip it up as a weeknight meal. Beef stew is a Keralite Christian dish – if you don’t eat beef, feel free to use any ground meat! Instead of ground beef you can use ground lamb or goat, chicken, turkey etc. I first came up with this ground beef stew several years ago (here is my stovetop version). I found myself wanting Kerala beef stew but only had ground beef in the fridge. Now I find the ground beef version so easy to make that it’s my go-to any time a stew craving strikes! If you like this recipe, be sure to try out my Kerala chicken stew next! This Keralite coconut stew is made with meat, potatoes and carrots. I make this often because I almost always have ground meat in my fridge, making this an easy dish to throw together at the last minute. The coconut milk mellows out the flavor, making this a mild curry. Press the sauté button, add the coconut oil. Once it melts, add the mustard seeds and when they begin to pop, add the onion, Serrano pepper and curry leaves. Stir-fry for 6-7 minutes, or until the onions begin to brown. Add the garlic and ginger and stir-fry for 30 seconds. Add the spices, stir, then add the ground meat and cook until it is mostly browned. Add the carrots, potatoes and ¼ cup water. OMG Ashley, this is amazing! It’s so hearty and satisfying! I made the meat masala using your recipe too. I am trying not to help myself to another bowl! Thanks so much! Can I use coconut powder? And how much. I would have never thought of using ground meat for making stew but that is exactly what I had and it was delicious!! This is the second recipe of yours that have made in the past week. The chicken biryani was delicious as well and honestly I was skeptical as I have been disappointed in the past with cooking Indian chicken curries in the instanpot. So thank you!! So, so good! Picky son loved it too – yay! I boiled with the coconut milk – does that make a difference, do you think? Found this recipe in your cookbook, and tried it the other day – it’s the meat masala that makes it all magical! Also, I substituted 1.3lbs of chicken thighs (because I didn’t have any ground meat on hand), and added the coconut milk before cooking…wow…blew my mind! I saw it was similar to your korma recipe. Anyway, I say all that to say, THANK YOU for changing the way I cook Indian food – I am your biggest fan! Your recipes are so adaptable, but I love how I can just blindly follow your recipes EXACTLY and they’re perfect.